July 2010 – King James Only? In our last post on the diversity of modern translations, we focused primarily on a group of translations called revisions. They are works that at least purport to be revisions of the Authorized Version, originally published in 1611. In this post, we will be looking at one type of original translations – those which employ a translation technique known as dynamic equivalence – and in a subsequent post, we will explore original translations which purport to be more formal in their translation (such as the HCSB). This is also known as free translation or idea-for-idea translation. It is a philosophy which does not attempt to maintain the flavor of the original text but is not restricting to translating the exact words. It allows the translator to use contemporary language without conforming to the forms of the ancient languages of Scripture. The translations are generally very readable and the English is more comfortable to the reader. The translation requires more interpretation from the translator than formal equivalence. Difficult passages can be left ambiguous or altered, both intentionally and unintentionally. It tends to not produce a transgenerational translation because idioms change and language can be outdated quickly. You can see that dynamic translations are a mixed bag, and depending on the translators and the rigor of the translation, they come in varying qualities. Although not the first dynamic translation, the New International Version is by far the most popular. According to the Association for Christian Retailers (CBA), more NIV Bibles are currently being sold every month than any other translation (followed closely by the KJV, NKJV and NLT with the ESV rounding out the top 5). There are over 200 million copies of the NIV in circulation today. In September 2009, it was announced that a new edition of the NIV was being prepared and that all other editions and revisions would be discontinued. From the beginning of the project, the Committee on Bible Translation held to certain goals for the New International Version: that it would be an accurate translation and one that would have clarity and literary quality and so prove suitable for public and private reading, teaching, preaching, memorizing and liturgical use. The Committee also sought to preserve some measure of continuity with the long tradition of translating Scriptures into English. They [the Translators] have striven for more than a word-for-word translation. Because thought patterns and syntax differ from language to language, faithful communication of the meaning of the writers of the Bible demands frequent modifications in sentence structure and constant regard for the contextual meaning of words. Elsewhere, it has been remarked that they attempted to create a balanced translation, although the general consensus among commentators is that the NIV is more dynamic in its approach. When the New Testament of this translation was published in 1966, it was titled Good News for Modern Man. 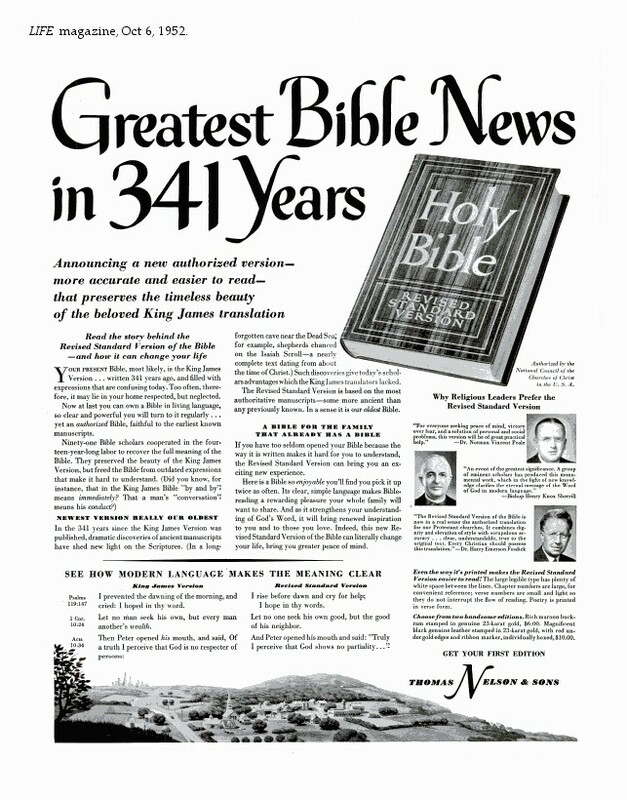 With the completion of the Old Testament in 1976, it was officially known as Today’s English Version and in 2001, it was officially renamed The Good News Translation in 2001, although it is generally known as Good News Bible. This translation does not follow the traditional vocabulary and style found in the historic English Bible versions. Rather it attempts in this century to set forth the biblical content and message in the standard, everyday, natural form of English…The aim of this Bible is to give today’s reader maximum understanding of the content of the original texts. In 2001, a new edition of the translation was presented (the quote above is from the 2001 forward). It was meant to update the language, because the committee felt that the language had become dated. The GNT has often been criticized for being too contemporary. It was a translation into extremely colloquial English, employing so much dynamic in its translation that it has often been called a paraphrase. Technically, this is not true since a paraphrase is generally accepted to be a paraphrasing of an existing English version (we’ll discuss that more in the next post). Like the GNT, the Contemporary English Version is sponsored by the American Bible Society. While the GNT was translated to be colloquial English, the English spoken everyday, the CEV was translated to be in the popular form of English found in magazines, books, newspapers and televisions. It was completed in 1995 and followed essentially the same approach that the GNT followed but reflects a different perspective on the English language, particularly how it is read and heard. The CEV has not gained a significant market, but it is currently slightly more widespread than the GNT, but probably only because it is newer. This section originally appeared in the 4th post of the series – Paraphrases. After consideration and discussing the issue with several people, I have placed it here with other dynamic translations. The difference between a dynamic translation and a paraphrase is vague, but sufficient evidence has been presented to persuade me to reclassify it. In 1989, Kenneth Taylor and the editorial staff at Tyndale House began to assembly translators and consultants to prepare a revision/update of the Living Bible which would be more of a translation. In 1996, Tyndale House released the New Living Translation (NLT). The NLT proved almost as popular as the Living Bible was in the 70’s. It is consistently one of the best-selling translations in America and has sold millions of copies. In 2004, a revision produced a second edition (sometimes called NLTse) which made broader breaks from the Living Bible. The second edition does not reference the Living Bible in the Preface, whereas the first edition made the connection very plain. There are a number of other translations that border on dynamic equivalence. Other translations not included are minor translations which have not gotten broad acceptance. I should mention, just by way of disclaimer, that I do not care for most dynamic translations, even as tools. For awhile, we considered using the NIV as a congregation, but elected to go with the NKJV. I later personally switched to the ESV, but we continued using the NKJV in worship. In 2009, our church merged with another congregation (you can see about that on my personal blog – http://unorthodoxfaith.com) which uses the NIV as pew Bibles. As a result, I use the NIV now in preaching, but only out of necessity. Having read through the NIV in my journey to find a translation I was comfortable with, I found the language to be too simple to convey the majesty of the Scriptures’ words. I find that while it is mostly accurate, it is rarely precise or powerful. My experience with the GNT and the CEV is very limited. I own them and have browsed through them; but they did not sing to me. A revision translation is one which begins with the Authorized Version and attempts to update it. The degree to which they are updated varies widely. They are distinguished from the initial revisions of the Authorized Version which were more updates of spelling, additions and corrections of versification and other typesetting issues. These revisions (conducted several times between 1611 and 1769) are generally considered acceptable by King James Only advocates whereas the latter revisions come under serious criticism. These two translations were undertaken more or less simultaneously. Strictly speaking, they were not translations but revisions of the Authorized Version of 1611 (having last been revised in 1769). The transliteration of YHWH as Jehovah instead of LORD or GOD. Updated spelling and prepositional use. Several returns to the Authorized Version reading because of general usage. Limited use of marginal notes, which the RV used rather heavily. In short, the American committee felt that the RV was too much of a departure from the AV and sought to retain some of its more majestic language while updating it stylistically and in some places textually. We are not insensible to the justly lauded beauty and vigor of the style of the Authorized Version, nor do we forget that it has been no part of our task to modernize the diction of the Bible. But we are also aware that the rhetorical force and the antique flavor which we desire to retain do not consist in sporadic instances of uncouth, unidiomatic, or obscure phraseology. While we may freely admit that the English of the Scriptures can, as a whole, hardly be improved, yet it would be extravagant to hold that it cannot be bettered in any of its details. These revisions were not widely accepted, although the RV was used in some versions of the Common Book of Prayer. Because it was based on the works of Westcott and Hort, who were among the translators, it caught considerable criticism who felt that their critical edition of the Greek New Testament was lacking. The RV/ASV was clearly a translation in trouble. It was not as clear or as universally accepted as the Authorized Version had been. The ASV gained popularity in many American seminaries and had some influence in Britain as well. In 1928, the copyright of the ASV was obtained by the International Council of Religious Education and with financing from Thomas Nelson and Sons, they commissioned a panel of 32 translators to begin work. When the New Testament was presented by the translators, the dean of the translation committee said that it was meant to be a supplement to and not a replacement for the AV and the ASV. The RSV was a very ecumenical translation, commissioned by a group that would become the World Council of Churches. It is generally thought of as a step backward from the ASV. In many places in Isaiah, the translators followed the newly discovered Dead Sea Scrolls simply because they were new and not for any textual reasons. They muddied perfectly clear translations from the AV and ASV. The RSV did, however, benefit from knowledge that had not been available at the time of the RV/ASV translation. Despite the weaknesses of the RSV, it still managed to become something of a standard in mainstream denominations. Seminarians were endlessly frustrated with it. The RSV was considered too liberal and too ecumenical. The Lockman Foundation commissioned a separate revision of the ASV, which was published in its entirety in 1971 as the New American Standard Bible. Unlike the RV and RSV translations, the NASB was the first to be submitted to external review – a practice employed in the translation of the Authorized Version but not since. The NASB went the opposite direction of the RSV. The translating committee was made up of conservative theologians and language experts who revised the ASV text to be more literal and in keeping with doctrinal purity. Gone where the fadish translations from the Dead Sea Scrolls, replaced by the most up-to-date edition of the Masoretic text, Biblia Hebraica Stuttgartensia. For the New Testament, the NASB translators worked primarily from the 26th edition of the Nestle-Aland Greek New Testament. This edition was vastly improved from the 17th edition used for the RSV. The NASB gained widespread acceptance, particularly in American seminaries and conservative churches. It was, however, strictly a Protestant Bible. There was no Apocrypha or Catholic edition (something done with the AV, as well as the RV and ASV). It was the first fully American version of the Bible. The World Council of Churches decided to revise the RSV to meet this ecumenical need. To appeal to more conservative groups, they followed many of the same steps the Lockman Foundation had pioneered with the NASB. The translation reverted to the more archaic terminology (thee and thou) of the formal liturgies, but also developed ‘gender neutral’ language to accomodate the growing number of female clergy in mainstream denominations. The committee states quite directly in the preface that this Bible was translated to be ecumenical, although they later also claim that it is “essentially literal.” The difficulty that arises from the tensions of trying to produce a denominationally/doctrinally neutral text while remaining literal should be obvious. Frustrated by the proliferation of translations that were more dynamic in their translation (look for these in part 2) and the liberal lean of the Revised Standard Version, a group of American conservative scholars under J.I. Packer as editor began a conservative revision of the RSV, which was published in 2001. Remarkably, Packer obtained permission from the very liberal National Council of Churches to produce a revision of the RSV. As I have pointed out previously, this type of ‘intentionally archaic’ language was one of the hallmarks of the Authorized Version. Packer and the ESV translators worked very hard to produce a worthy successor of the Authorized Version, something that struck the balance between formal translation, majestic language and readability. Unlike the previous revision translations, the ESV made dramatic returns to the underlying philosophy of the Authorized Version. While not perfect (it was quietly, revised in 2007), it was translated to be a readable, theologically conservative, literal translation. The question of why I did not include the New King James Version in this post has come up a couple of times, so I am adding this note to clarify. The New King James Version is a unique case which will receive its own treatment in the fourth article in this series. While a revision, it does not follow the same thread as the versions presented here. It is instead a direct revision of the Authorized Version. It will be treated separately, with notes about KJV2000, the Modified King James Version and other various (but minor) attempts. One Bible Only? Examining Exclusive Claims for the King James Bible may just be the best book on the King James Only debate, period. The posts in this series are tracing the arguments of Kevin Bauder, in his conclusion to the book: “An Appeal to Scripture”. He explains several theological arguments that KJV Onlyists resort to, in an effort to continue propagating their belief against a mass of contrary evidence. Bauder shows that these arguments are really illusions that don’t stand up to scrutiny. Part 1 set the stage, and part 2 dealt with “the appeal to faith”. Now in part 3, we come to “the appeal to reason”. Bauder makes the case that this demand that perfect inspiration requires perfect preservation does not stand up to Scripture itself. First, he shows that not all of God’s spoken words were recorded in Scripture. Pre-flood instructions on sacrifices, the seven thunders of Revelation (Rev. 10:1-4), and Jesus’ words that aren’t recorded in Scripture (John 21:25) all are evidence that perfect words of God can be given and yet not preserved. Bauder’s second line of argumentation here deals with the written words of Scripture comparing the actual record we have in Scripture with the KJV Onlyists requirement of perfect preservation. Bauder finds that the testimony of Scripture doesn’t support perfect preservation. His thoughts are worth repeating at length. …In all of the cases enumerated herein, God gave specific, verbal revelation, but He did not necessarily see fit to preserve all of the words and exactly the words in a publicly accessible form. The doctrines of inspiration and inerrancy (which are absolute truths) and the King James-Only proponents’ postulate of perfect preservation (which is dubious speculation) are certainly not inextricable corollaries. All parties to this debate acknowledge that God has superintended the choice of the precise words that would be used to communicate His truth. To accept this fact, however, is not to concede that God is obligated to preserve every word through which His truth has been revealed. He might preserve some words and He might permit some to be lost, depending upon His own purpose. The appeal to reason is not a sufficient ground for the King James-Only argument. What Bauder has done here is extremely important, in my view. He goes to Scripture itself to see how important the preservation of the specific wording of a text is. When one can see parallel accounts in the OT and NT which do not line up perfectly in word order and precise wording, and when one sees quotations of other texts which are not word perfect, why shouldn’t one conclude that a certain latitude is permissible here, that minor variations among translations of Scripture do not affect their authority? This is a debate blog. Healthy discussion is the whole point of maintaining a blog about the KJV Only controversy. Ground rules are essential to any debate, and its best to make the expectations very clear up front. We’ve had to delete comments, edit them and even ban people from commenting in the past. But as this is a group blog, sometimes we’ve disagreed with ourselves in how to enforce the rules and what expectations we have. 1. Please write your comments plainly and neatly. Remember that written text often sounds different in another’s head than it does in yours. Be ready to clarify; and on the other side of things, be ready to ask good questions. 2. This is a discussion among Christian brothers and sisters, for the most part. It should read like a discussion among brothers and sisters, not like hate mail or attacks (from either side). 3. Name calling and ad hominem accusations are not appropriate for this discussion and such things will be edited out of your comments. Repeat offenders will be moderated, warned, and if necessary banned. 4. The authors of this blog represent diverse Christian traditions. We often model proper interaction in responding to each other’s articles. 5. The opinions of commenters are their opinions. We do not assume responsibility for their statements. 6. Stay on topic or take the discussion off-line. 7. Do not make lengthy quotes from sources using cut and paste. These quotes will be abridged by the site administrators. 8. We welcome re-posting and tweeting on the topics and issues we raise. We ask that you link back to the original article in your re-post and do your best not to reproduce whole articles or quote us out of context. 9. These guidelines will be amended and appended as necessary to maintain a healthy environment of discussion. This post is from our newly edited “What is KJV Only?” page. KJV Onlyism is hard to define. And like any grass roots movement, there are many competing manifestations of it. As a former, self-dubbed “KJV-onlyist” I will try to carefully put forth a definition. I know I’m going to say something wrong here and won’t please everyone, but I hope the end result is helpful for those new to the debate. The KJV-only position holds that the only Bible an English speaking Christian should use is the King James Bible. While some KJV-only proponents bristle at the label viewing it as a derogatory term, most don’t hesitate to affirm it. In KJV-only circles, you cannot disavow the label. Rather, you qualify it. Now, for study, some KJV-onlyists may allow the use of other translations. But for memorization, church preaching and teaching, and general reading, the KJV should be the only version of the Bible one uses. Different KJV-onlyists will offer different answers to this question. These are some of the common arguments used by most KJV-onlyists. The Better Text Argument — The KJV is the only widely used Bible exclusively based on the Textus Receptus Greek & Masoretic Hebrew Texts. The Better Doctrine Argument — The differences between the KJV and other Bible versions are examined and the KJV’s readings preserve a superior doctrine and more of Jesus Christ’s divine titles. The Conspiratorial Argument — The manuscripts that support the newer Greek text were only found recently and were found in areas like Egypt where false doctrine was prevalent. The Historical Argument — The Reformers and Puritans used the KJV and it launched worldwide missions and the Great Awakenings. The Better Manuscripts Argument — The manuscripts that support the text behind the KJV agree with one another closely, don’t show signs of textual corruption and represent the vast numerical superiority – 90% of the manuscripts. The Better Translation Argument — The KJV translators were masters of English and knew Greek and Hebrew and multiple other languages far better than translators today, plus they used a literal translation technique instead of the dynamic or loose method in vogue today. I mentioned before that there are numerous manifestations of KJV-onlyism. Sometimes the different groups are treated like one entity. I want to be careful to distinguish terms and not broad-brush the entire movement by the crazy antics of Peter Ruckman or Gail Riplinger, for example. Generic KJV Only Position — Most KJV Onlyists find themselves here. They haven’t thought out a more specific position, or just believe the KJV is the only Bible that should be used and leave it at that. English is Inspired View — This view takes issue with anyone correcting the KJV English. Since the Bible seems to show translations of the OT as being treated like they were inspired, the English is treated like it is inspired. Some versions are more strict than others, but all bow to the KJV as the final authority before they would trust a lexicon or dictionary. Double-Inspiration View — This view goes further and says the English corrects the Greek. In some sense the KJV was inspired directly by God. People with this view (and some of those in the previous view) would hold that translations of the Bible into other languages must be guided by the English of the KJV. Pure Seed View — This idea comes from 1 Pet. 1:23-25 and basically claims that the use of the KJV is essential for people to be saved. No one can be saved from an impure seed (the NIV, for instance). Any of the first three positions above could hold to this view as well, but no one in the next three camps would. TR Only View — This view holds the Greek and Hebrew as superior to the English, but also holds that they were word-perfectly preserved. The text behind the KJV usually is the text held to be the word-perfect copy of the original text. The word of God is “intact” in English, and while they would correct the sense of the KJV through scholarship and original language study, they still would not see this as any kind of overt error in the KJV. Few if any, TR-onlyists use the NKJV however. Ecclesiastical Text — This view places greater stress on church confessions and the historic use of the Textus Receptus by the church of the Reformation period and afterward. Some in this view would hold to errors in either the TR or the KJV, and some would use the NKJV or 21st Century KJV. Majority Text — This view should be distinguished from the previous views. Proponents of the Greek Majority Text may or may not use the KJV or NKJV. They hold to a textual theory of the superiority of the Byzantine view, but they acknowledge the merits of careful, believing scholarship and textual criticism. As the Majority Text as such didn’t exist prior to 1980, they don’t see adherence to that text as a binding matter of faith for all Christians. King James Preferred — This view is held by some who see some weaknesses with the King James Only position, but still believe the TR is the best text we have or else use the King James primarily for traditional or other reasons.